THANK god for the Soup Mate and its brethren, the ‘‘Soup Simple’’ and the ‘‘Soup Maker’’, all of which address the obviously crippling daily problem of how difficult it is to blend vegetables into liquid. Yes, there really is more than one appliance costing $100 or more that does exactly the same thing as a blender and an old saucepan. What a golden age we live in. APART from concrete parachutes, waterproof teabags and bike-mountable ashtrays, is there anything more useless than a car alarm? Whatever genius came up with it was far more optimistic about people’s capacity to care about others’ property than I am. If I hear a car alarm go off in the wee hours of the morning, I’m not dashing outside to catch a thief redhanded. Frankly I’m willing him to get a bit better at his chosen occupation and make off with that car more quickly so I can get back to sleep. Given that car thefts aren’t yet at 0 per cent it’s safe to say burglars aren’t really bothered by alarms either. So all round, a pretty useless invention. eradicated here. As fortunate citizens of the Western world so many of our needs are met, we barely want for anything. But that doesn’t stop manufacturers wanting to sell us things, and they do that by creating useless products to solve problems that don’t actually exist. 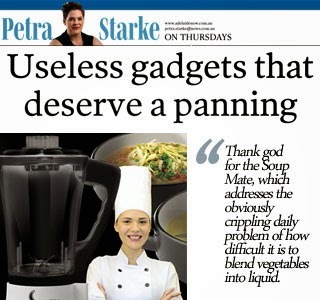 Take the ‘‘Soup Mate’’, an appliance so incredible it warrants its own show (well, they called it a show – I’m pretty sure it was just a 20-minute advertisement, but it was still more entertaining than Celebrity Apprentice). breakthrough in soup making since the invention of pots and pans’’. So thank god for the Soup Mate and its brethren, the ‘‘Soup Simple’’ and the ‘‘Soup Maker’’, all of which address the obviously crippling daily problem of how difficult it is to blend vegetables into liquid. Added bonus: you can also apparently use the Soup Mate ‘‘as a teapot’’. If you like your tea flavoured like last night’s soup dinner, obviously. While we’re junking up our kitchens with utterly useless appliances, why not try the ‘‘Pie Magic’’, for all those occasions you need to make two tiny pies at a time? Or the ‘‘Snack Heroes Egg Cooker’’, the $30 electrical appliance that does exactly the same thing as an old pot filled with boiling water? Or the ‘‘Fondue Maker’’, ‘‘Crepe Maker’’ and ‘‘Hot Chocolate Maker’’ – all just less useful versions of the skillet and saucepan? who don’t know how to make soup in a pot keep buying them, they’ll keep churning them out. gadgets and gizmos with which we junk up our houses. We’ve seen, in horrific detail, the tragic effects of the West’s insatiable appetite for cheap clothing in last month’s Bangladesh factory collapse, which killed more than 1100 people. Perhaps it’s time we reassess our ‘‘need’’ for useless crap and focus on quality goods at a fair price. Bring on the pot and pan revolution. First published in The Advertiser, May 30, 2013.